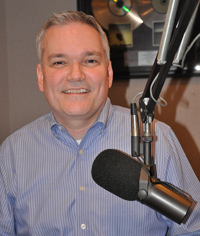 Welcome to KXOJ and thanks for taking to learn more about the people you hear on the radio! It also means that if there is ever a way you think we can improve KXOJ in any way to please let me know. We want to continue to get better and grow at what we do. I also host the KXOJ Family Reunion Sunday nights from 7-10pm. We take a trip down memory lane for the best music of the 90’s and 80’s. If you love classic Michael W. Smith, Steven Curtis Chapman, Rich Mullins, etc. then I invite you to join me for this fun show. I’m also an admitted computer geek. I design websites, write software and do other geeky things in my spare time. It’s that, or cheer on the Sooners when I’m not with the family or working. It sounds cliche’ but we know that without you we would not be able to do what we do and enjoy the careers we have. We value our listeners so much. Thanks for being part of our listening family!